I love to pho­to­graph the city in win­ter. The light is like no other time of year since the sun is always low in the sky. Long shad­ows crawl across the snow cre­at­ing inter­est­ing lines. The light often has a sub­tle pink­ish glow that you only see in sum­mer at day­break. There is a clean crisp­ness to the air and the land­scape. The bare trees and snow cov­ered streets cre­ate a clean min­i­mal­ism you don’t have in summer. 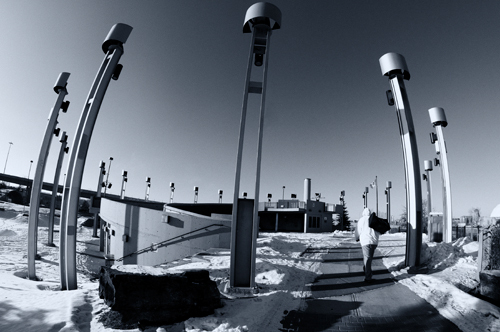 I was out wan­der­ing about with my newly pur­chased 8mm fish­eye lens on a crisp Sun­day after­noon. The tem­per­a­ture was hov­er­ing at minus 20 C with the bit of wind chill. It was sunny and the snow was reflect­ing the light back on every sur­face. I was in the skate park with the idea I could try out some inter­est­ing exper­i­ments with the snow cov­ered skate domes. The new C Train over­pass also runs along the edge of the park, so I thought it would work well with the lens’s dis­tor­tion as well. The prob­lems that a cityscape pho­tog­ra­pher faces in win­ter are not much dif­fer­ent than what a land­scape pho­tog­ra­pher would expe­ri­ence. Our ter­rain is gen­er­ally a bit smoother but it is equally as cold, so I always dress about the same as you would expect to dress if you were out in the moun­tains. I am usu­ally out for a few hours at a time, so I make sure I am pre­pared for the weather. The advan­tage I have over the rugged land­scape pho­tog­ra­pher is that I can find a Star­bucks to warm up in pretty quickly when the going gets too cold! If you are out in sub-zero tem­per­a­tures for extended peri­ods of time, you will have to con­sider how to care for your gear. I usu­ally carry an extra bat­tery in my pocket but so far I have not had to use it. Recently, while out on the street on a crisp day of about minus 10 C, I noticed the sun shin­ing into one of our plus 15s that is acces­si­ble from the street. I thought it might make for an inter­est­ing shot from the inside and climbed up the stairs to go inside. Well– myself, (I wear glasses) the cam­era LCD screen and the lens fil­ter all fogged up as you might expect. After a few min­utes the fog­gi­ness cleared and I was able to get the shot. I am told that hav­ing a fil­ter on the front of your lens helps keep mois­ture off the lens itself so you may want to con­sider a UV fil­ter for that rea­son. Also when I come in from shoot­ing on a cold day, I remove the mem­ory cards from my cam­era, pack up the cam­era and lenses in the bag, then I zip it up tightly. I let every­thing return to room tem­per­a­ture for sev­eral hours before remov­ing the gear from my bag. That way I avoid the prob­lem of con­den­sa­tion on my cam­era and lenses. Hav­ing a well padded cam­era bag is use­ful for this reason. For this photo, which I call “Urban Trek”, I was lin­ing up the 8mm fish­eye lens to show off the cir­cle of street lights in the park. Some­one walked into my frame and I snapped the pic­ture. The idea of the urban trekker appealed to me. Here we have an urban­ite fac­ing the harsh cold ele­ments sur­rounded by this stark bright land­scape. His dress and pos­ture fur­ther empha­size the cold tem­per­a­tures as he quickly walks to his destination. Jacque­line A. Sheen is a pho­tog­ra­pher liv­ing in Cal­gary Alberta, Canada. You can check out more of her work at www.jasphoto.ca and she also goes by the han­dle JAS_Photo on our pho­tog­ra­phy forum. Thanks for the extra infor­ma­tion and awe­some shot. I like the per­son walking. I have been asked what a plus 15 is since not every­one is famil­iar with the term. They are sky­walks or bridges that con­nect build­ings in Calgary’s down­town core, thus mak­ing it pos­si­ble to travel from sky­scraper to sky­scraper with­out going out­side. They rise above the ground at 15 feet, hence the +15 name. Some are mul­ti­leveled and called +30’s or +45’s accordingly. The plus 15 I men­tion in the arti­cle above is one that goes from a down­town office build­ing to an out­side parkade, thus I was able to access it from the street.